IMPORTANT: Please contact the owner for details BEFORE booking online. This H.A. system has trouble determining rates based on the size of your group, etc (for instance, a couple only needs the main cabin with a main season weekly rate of $1400 plus $98 tax. A group of six needs both cabins at $1800 plus $126 tax). The posted "average" rate is often inaccurate. This log cabin and guest cottage sit on a lovely, grassy bench on 21 acres at the base of Emigrant Peak (elevation 10,960). The views from the cabins are stunning and the cabins themselves are comfortable and cozy, filled with books and interesting collectibles. The two-bedroom main cabin has a full bath, a hide-a-bed, a fully-equipped kitchen, a TV/VCR/DVD, satellite TV, wireless internet, and a stereo. It's available for rent by itself. The two-bedroom guest cottage has two full baths. It has no kitchen facilities, and so is available only with the main cabin (the two buildings are never rented to separate parties). The property borders vast public land; the hiking from the property is excellent. 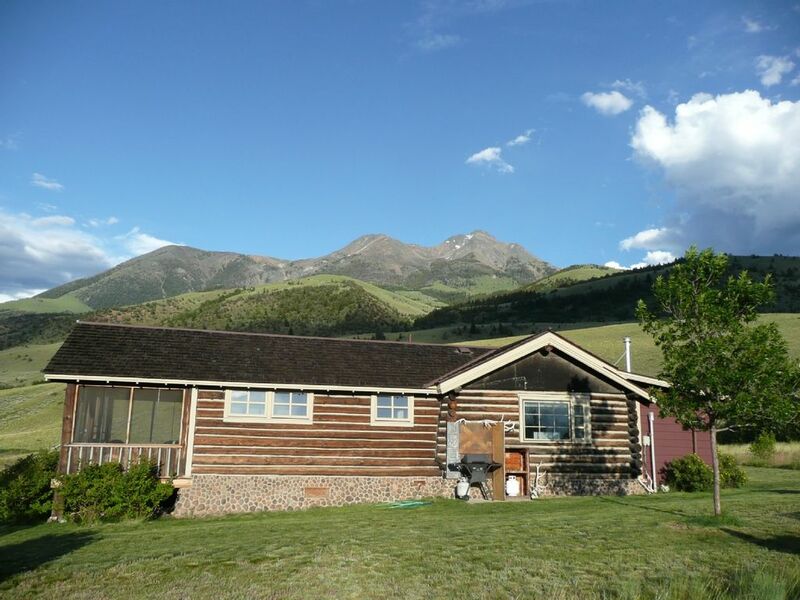 The cabins are located midway between Yellowstone Park and Livingston, Montana in the Paradise Valley. The Yellowstone River, Chico Hot Springs Resort, and the Absaroka-Beartooth Wilderness are close by. Wildlife seen (by eye or scope) from the cabins includes elk, deer, wolves, bobcats, foxes, eagles, hawks, bluebirds, and cranes. The cabins are available and enjoyable year-round, and have central heat as well as a wood stove in the living room and a cute gas fireplace in the bedroom. The climate from late spring through early fall is usually temperate, although mornings and evenings can be cool. Winter conditions fluctuate widely, with temperatures ranging from well below zero to well above freezing. Winter is more of an adventure, but is unfailingly beautiful. The log cabin has a washer, dryer, and unique outside clothesline. For recreation, the log cabin has a TV/VCR and a stereo with CD player. It also has a library of fiction, non-fiction and naturalist reference as well as various board games. Outside there is a rustic basketball hoop and a maintained horseshoe pit. The property has direct hiking and horse access to millions of acres of public land. The cabin has a full featured digital weather station, with readouts for wind speed and direction, temperature, precipitation, etc. What an amazing cabin! The pictures do not do this place justice! Chuck sent us a map and directions to our house before we drove out. That was a huge help, since I am not too sure my GPS would’ve sent me to the right place! The drive up is gorgeous... mountains, cattle, fall colors (in October!!) and overall great views. Since it was just my husband and I, we only used the main cabin, but did sneak a peak into the second cabin. Great little place for another couple or older kids. The main cabin was perfect! Two bedrooms, both with great views! One of the most well stocked kitchens we have seen - and we use VRBO a lot. Don’t worry about the basics. He has them. Flour, sugar, coffee, canned goods, spices, oils and sprays for cooking and basic condiments! There is a dishwasher, which is great (we just hand washed - it was only the two of us) and a fully stocked kitchen for all your cooking pleasure! The wood stove was so great. It heated up the main living area and had a great ambiance. It gets warm quick!! Chuck has thought of everything in this cabin. There are maps, backpacks, bear bells, bear spray, flashlights, binoculars, toys, games, amazing selection of books, good wi-fi, a cozy desk to work at or write in your journal, so many cool antiques to look at- we didn’t want for anything! We didn’t use the outside so much, it was usually dark when we got back to the cabin, but the porch was great to sit on and enjoy the last light of the day and there is a fire pit, horse shoes, huge picnic table, an old school hot tub (I don’t think it works, but cool to look at), clothesline (although there is a washer and dryer inside for those not so adventurous! ), a basketball hoop and views galore! The property is 20 acres and backs up to BLM land, so there is plenty of space to roam and explore right out the door, not to mention in Yellowstone! We will most definitely be back to enjoy this gem again! We've never stayed in a place quite like this before where we had a lot of property around us and the sense of serenity, beauty, and remoteness. It was just what we were looking for in that way. This property has a separate building with two bedrooms which was great for our teenagers so that they felt they had the world to themselves. We didn't worry about them, because the property is totally separated from others around you and situated on several acres. The hospitality of the owner was great and the cabin made you feel like you had stepped back in time but we still had the modern amenities we needed. Waking up early to see the sunrise and witness the deer and other animals munching breakfast was fun for everyone and at night when we went to bed, we left the windows open and it is not often you can hear the breeze against the grass and trees outside without _any_ disturbance from modernity. The property was well maintained, and while you are probably 20-30 minutes from the entrance to Yellowstone, I would stay here again in a heartbeat when I go back to the Park. And I would say you anyone you need to experience this and take in the mountains, enjoy the brook nearby, ride around the area, and get up early to see nature as it probably was a long time ago. If you do that, you'll feed your soul. I know I'm being a bit cheesy, but we really enjoyed this place. Stunning views away from it all! Chuck's property was a great option for our group of 7 to start our 15 day vacation. It's remoteness made it a perfect place for us to get away from it all. Chuck was great to work with. The cabin, and cottage, were clean and comfortable. Be sure to pick up supplies prior to arrival as it will be a 30 minute drive to town if you forgot something... Spending the mornings on the back porch, soaking in the views and listening to nature was a perfect way to start each day. We would look to stay here again if we are ever back in the area. A Great location for our Yellowstone vacation! We rented the house and the adjacent cabin for our Yellowstone vacation. Our vacation included my wife, two of our adult children with their spouses, and 5 of our grandchildren, ages 9 months through 10 years. The owner, Chuck, was extremely responsive to our questions by email and phone to insure our vacation was great. The location is beautiful and safe. The property is remote and surrounded by a fense. The house and cabin was very well furnished, even with supplies I have never seen in a rental property. The location was perfect for the Yellowstone vacation. It is midway between a reasonably sized city and a more touristy city at the entry to the park. This provided easy access to stores and restaurants to make our stay economical. With all the ammenities of a home, we could do our wash daily (important with 5 young grandchildren), fix our meals and picnic lunches, and spend the evening hiking or watching TV with our children. I highly recommend this location for your visit to Yellowstone. We were completely happy with our stay and with the help Chuck provided to help us enjoy our vacation. Gorgeous views and a great cabin! Booked the main and extra cabins on the strength of the reviews and wasn't disappointed! Chuck was around to greet us and made sure we had anything we needed. Great guy. Roosevelt Arch was about 35 minutes away and we used a week to spend about 4 days in Yellowstone. It is a bit of a drive with the park being so big but still worked out very well. My older kids liked it so well that they are thinking of planning a trip next year to stay in the same cabin. The cabin and guest cottage are on a private road at the base of Emigrant Peak in the Paradise Valley of Park County Montana. The property is located almost equidistant from the town of Livingston and Yellowstone National Park. Rates are subject to change until reservations are confirmed. The cabin and guest cottage are available together or the cabin may be rented by itself.